Rated 5 out of 5 by emiddleton from Love it! I love all of the Delicious games, I have them all. I also love the spin off games this one has created. The storyline is touching and funny. The games are challenging and not boring. You can choose from 3 different skill levels. You won't go wrong buying any of the Delicious games. I'm team Emily! Rated 5 out of 5 by jnow1101 from Another Delightful Delicious! This latest installment in the Emily's Delicious dynasty does not disappoint! It starts off relatively easy, but builds up in difficulty with each level. I always look forward to the next installment and the extended family is a delightful bunch! I would love to see something with Francois...he is such a faithful character. He needs his time in the spotlight. 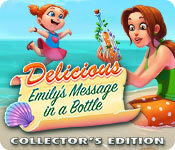 Rated 5 out of 5 by suejohn6151 from Emily's Message in a bottle Great game. But all the Delicious games are. Rated 5 out of 5 by pintade93 from Amazing game series I love the Emily's stories. Fun, colors, smiles and happy ending ! Emily's back and for the first time, she's not the main character. In fact, we discover a delicious family's story with italian cuisine. We travel with them in different ways : journey in Italy and time travelling when we meet family and friends. I really loved it ! Kisses to Truffles ! Rated 5 out of 5 by flowersis from Delicious Emily never disappoints This game was fantastic! Great storyline and simply lots of fun. 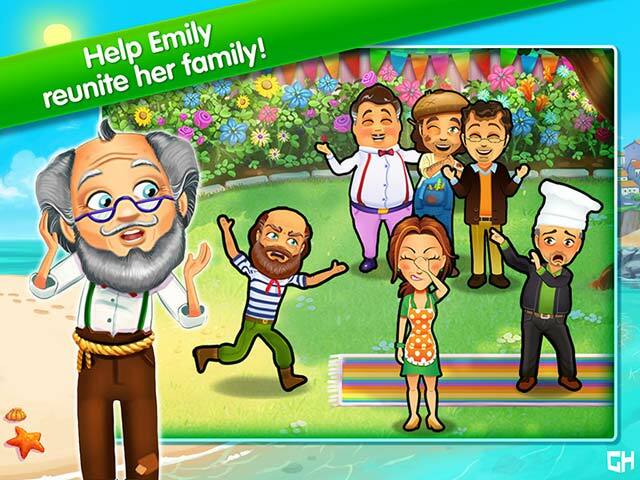 If you've played one Emily game and enjoyed it, you'll LOVE this one! I sure did. Rated 5 out of 5 by Boscoe1 from Love Love Love It Just as I love the previous games, I love this one just the same. Great story line again. Can play nonstop for hours! Rated 5 out of 5 by wizardrywand from Another awesome Emily game I love the storyline for this Emily game. The gameplay was excellent as usual, and the bonus levels were definitely worth getting. Rated 5 out of 5 by TJC333 from Fan of Delicious Emily I love these series of games. At first I thought the story was a little boring, but as I continued to play and pay attention to the story it turned out quite sweet, like all the stories of this series. The game play wasn't very challenging however, but still fun, which is my only negative to the game. Still cute graphics, cute story and overall a pretty fun game. Rated 5 out of 5 by vl050979 from Love this series and it's spin offs! Great story line, this one was a tearjerker at the beginning. Totally replaces my love for the now retired Diner Dash.....keep them coming and I'll keep on purchasing them. This series also has awesome spin offs including other characters from the Delicious Series. Rated 5 out of 5 by Amethyst56 from Another chapter in Emily's family saga I love this newest installment of Emily's family saga! A fun and Interesting story line tells us more about Edward's (and Emily's) family. Great fun! Rated 5 out of 5 by DreamWalker1960 from Another great Emily Game this one is awesome. Finding the mouse was more of a challenge but it made the game fun. Also the bonus games were mostly different from the other Emily games and loved that challenge too. Keep Emily coming!!!!!!! Rated 5 out of 5 by EWK24 from So well done! This is a wonderful series that never disappoints. Love it! Rated 5 out of 5 by Gordon24Fan63 from Delicious Games I love all the Delicious games, I play them over and over, hope they keep making more ! Rated 5 out of 5 by Kraanvogel08 from Another Delicious adventure Could not wait until it was available on BF! The gameplay is similar to Hopes & Fears, with mice to find and diamonds to collect. This time Poppa has 'popped' up again and Emily is trying to gather all the brothers of her father for a reunion to celebrate his return. Just enjoy another Delicious game! Rated 5 out of 5 by pennmom36 from The Delicious Secret Ingredient Nothing could be better than a long holiday weekend followed by a new Delicious Time Management game! This edition takes us back thirty years, to Napoli, Italy, where it all began. Emily was just a toddler approaching her third birthday at her Grandma Emilia's Italian restaurant. Grandma has passed away, but Emily seems to be Grandpa Vitto's little angel and the two of them are practically inseparable. Emily's Uncle's are pushing their father to retire and leave them the family business, now that Grandma has passed, but it's upsetting a heartbroken Grandpa Vitto. Emilia and Vitto started their business with only a dollar to their name, and their boys have no clue as to why the restaurant is so successful, it's because of a special ingredient! You will learn more about the roots of Edward's family as you manage the family business in Italy as well as Emily's restaurant in Snuggford, present day. You can choose from three modes of difficulty, Beginner, Normal or Expert, and there is an excellent tutorial as well as a "how to play" section to help you get started. 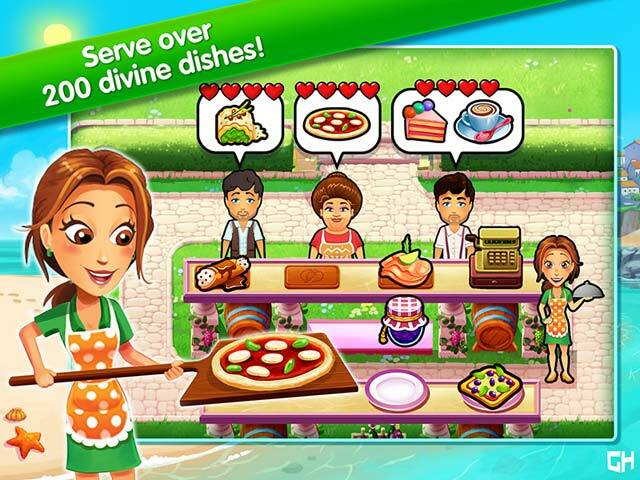 The gameplay is simple, wait for the customers to decide what they want at either one of the tables or the counter, then you click on the item or items they want as indicated inside the thought bubble, then click on the customer to serve the food and click on the register when they are ready to pay, and finally, click on the table to clean up the mess. The cute little mouse has returned, and you will receive extra points if you are able to "catch" him whenever he pop up in random places. Some of the customers want to toss a coin into the fountain to make their wishes come true, you have to give the customer a special coin and then click on the meter when the bar is in the green zone which will earn you extra points or money. As you progress, more food items become available, and dishes become more complicated. Some of the food items require you to combine several ingredients before serving them such as adding spaghetti noodles to the sauce, making a pizza with different toppings or making ice cream cones of different scoop or flavor amounts. There are some ingredients that require restocking as indicated by a quantity number, such as picking tomatoes for the spaghetti sauce. Once you have earned enough money, you can purchase upgrades, like new Tables and Chairs, Serving Counters, Pizza Ovens, and decorative or entertainment items designed to keep the customers happy, patient and willing to pay more. You will eventually get to choose menu items before each level, and as with all the Delicious games, you get to take 14 pictures of the O'Malley's to display in Emily's scrapbook. Diamonds that are earned playing challenges and bonus levels can be used to invite the family to the reunion. 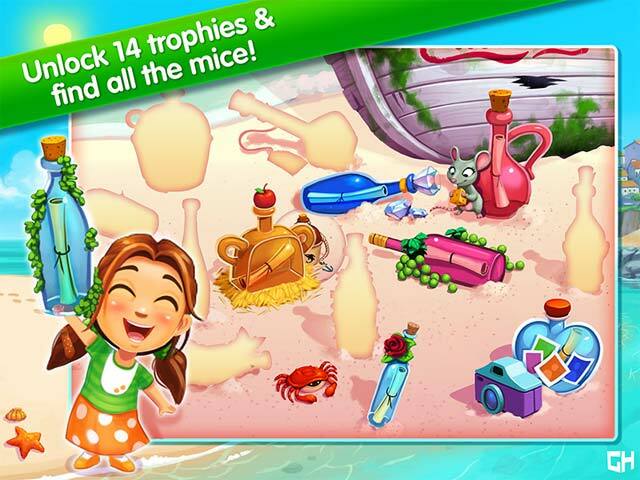 This Collector's Edition has 14 different Achievements to earn in the form of Messages in a Bottle. Each bottle contains brief messages from Delicious Emily fans, which is kind of a cool idea. Enjoy, it's simply Delicious! Rated 5 out of 5 by sb54 from another great Delicious Emily game When I saw the game on the web site I knew I would own this game. (I own all the games in the series).It starts out with Emily as a three year old,then fast forward to the present time.You have 3 options to play this game,easy, normal, or expert. It has a good story line. There's a scene when little Emily is singing a song about her grandpa. It is so cute.Those who have played the previous games will not be disappointed. Those who haven't ,well what's stopping you? Try it ,you'll like it. Rated 4 out of 5 by Vkann from UNTIMED modes in the Delicious Emily Series I know this is a timed management game, but my hands can no longer keep up and I love this whole series. If the series could have a complete UNTIMED mode I would love to purchase this series, it would be nice, fun and relaxing for me. I would like to thank you for listening and reading this. I have tried the HO games and they have gone quite dark for me in areas with creepy crawlies in them, I cannot manage this as it creates problems for me. This series would be a lovely change for me if this UNTIMED mode could be put in to all of them. I am sorry to say I cannot play a game unless I start them all from the start. So I know I am also asking a lot of you. Rated 3 out of 5 by paktype from A Good, Not Great, Emily Story This was a good chapter in the Emily saga, but it wasn't outstanding like the previous ones. The storyline simply was not compelling enough to justify the length of the game. The characters (especially Paige, as usual) were all terrific, fun and funny but midway through the game I found myself getting bored. There were many LOL moments but this one just wasn't that much fun. Rated 3 out of 5 by striley from Pretty weak for a Delicious game Pretty weak for a Delicious game and the end is pitiful. Buy it but don't pay full price. Rated 1 out of 5 by GerKayM from Depressing I downloaded the free one hour trial of this game. I thought it was odd, but ended up playing for just over 30 minutes. The story focuses on the death of the Grandma, but then focused on the death of the Grandpa, who essentially took his own life by setting sail on his boat during a bad storm. The entire storyline was very depressing, and I am surprised that so many people like this game. Rated 1 out of 5 by bluejen from Couldn't finish the demo Guess I'm in the minority here. I played for about 15 minutes and couldn't stand it. Way too busy and cutesy for me. The graphics and music were ok, but I just don't see the appeal.